Accessories help you create the environment you’re looking for. For weddings you may choose a traditional ivory coloured lining, chandeliers and gold banquet chairs, while for a party starlight lining, tall chairs and tables, and a dance floor may add the finishing touches you need. 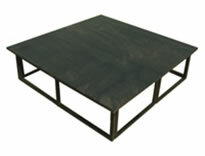 Whatever the event, Monaco stocks a wide range of features and accessories to suit your requirements. Below we list a few of the most popular additions ordered. But if you can’t see what you’re looking for or just want further details, it is best to get in contact by e-mail or phone. Monaco offers a variety of uplighters, which are suitable for a wide range of events. 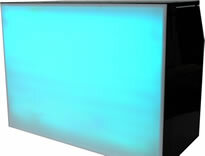 And our coloured filters can change the feel of an event from formal to informal, classic to modern, daytime to evening. Classic, ambient and decadent, our chandeliers provide an elegant way to bring light to your event. 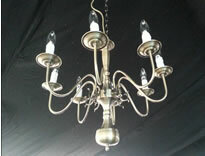 Available on a dimmer chandeliers give you complete control to create the perfect atmosphere. These high quality paper lanterns come in a variety of sizes and colours adding that extra special touch to your marquee. Use plain white for a neutral classic look ideal for a wedding or a selection of different colours to create a great party feel. 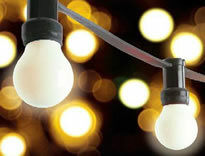 An option for both indoor and outdoor lighting, festoon lighting also known as rope lighting creates a romantic setting for any event; popular for weddings, engagement parties and anniversaries. 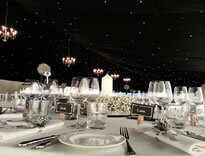 Simple yet effective, fairy lights add a subtle touch to your marquee. Available in 6m strips ensure you add them to your quote today. 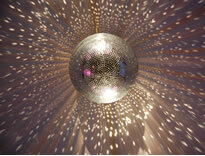 Our rotating glitter balls are a fantastic way to transform your marquee. A small spotlight is trained onto the rotating ball which shoots spots of light in every direction. 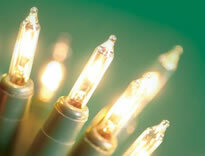 Starlight lining is a blackout roof lining with hundreds of tiny LED bulbs integrated into it. When lit the effect is a dazzling night sky of twinkling lights. Perfect to set the tone of your event. 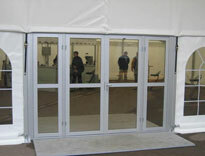 Glass doors are a perfect accompaniment to your marquee. 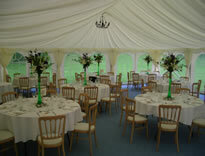 As well as looking aesthetically pleasing, they also are a great way to keep the heat locked inside your marquee. With an easy to use push bar system, it allows your guests to open and close the doors as opposed to canvas opening which are time consuming closing up letting that all important hot air escape. 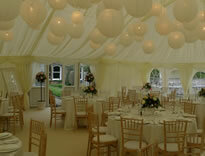 You needn’t let cold weather get in the way with heating available for all sizes of marquee. 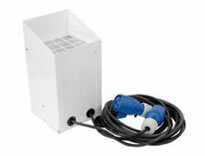 Our thermostat controlled heaters are fuelled by diesel and are able to distribute the heat evenly in your marquee. 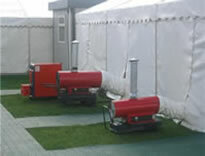 Two or more heaters are recommended for larger marquees. 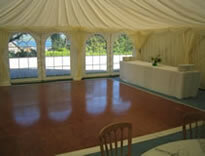 Wooden flooring provides a completely solid floor throughout the marquee. 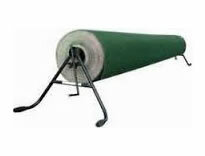 Recommended when the ground the marquee is erected on is bumpy or soft. 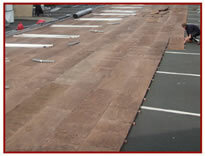 It is our most premium flooring and gives the perfect finish to the marquee. A great way to add a splash of colour to your flooring, our carpet is available in a multitude of different colours and can be laid on top of any of our flooring ranges. It is always recommended to complete the perfect marquee. No party or wedding is complete without a dance floor. The parquet dance floor is a real timeless classic. 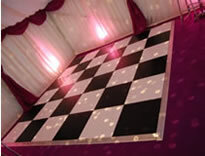 Subtle and elegant the parquet is still our most popular dance floor. 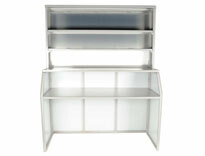 Ideal for mounting optics, displaying bottles and storing glasses. 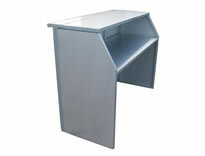 Shelving unit sits on our standard bar or can be placed directly on a table. Our stage panels are 8x4ft and 1ft high so whether you would like one stage section for a singer or four to accommodate a band, our stages have the versatility to suit your needs.